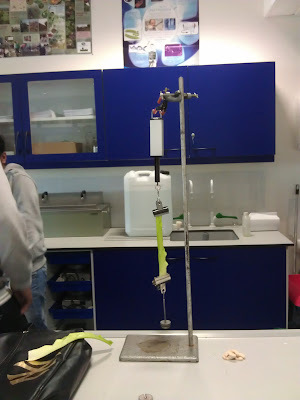 One of the Edexcel Unit 2 core practicals is the extraction of fibres from plants and the testing of their tensile strength. Students who have already done one of the AS physics practicals on Hooke's law should have had no trouble designing their own practicals, and I made sure there were physics students on each table to assist. Why yes, that would be an entire stick of celery wedged between the bulldog clips. Extracting celery fibres. UR DOIN IT RONG. Is it just me, or does that celery look a bit...nibbled on?